 DRINKS starting from just 99P B4  ENTRY from £1.99 B4 midnight 3️⃣ DJ’S 3️⃣ Floors of music ⏰ 11PM-4AM. 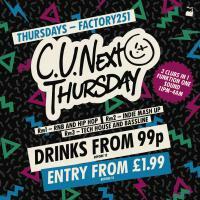 Factory 251 presents to you - C U Next Thursday!  DRINKS starting from just 99P B4  ENTRY from £1.99 B4 midnight 3️⃣ DJ’S 3️⃣ Floors of music ⏰ 11PM-4AM.